Does your garbage disposal clog frequently? Your garbage disposal is a useful tool in your kitchen. It is used to help get rid of leftover food scraps that would otherwise clog up your sink’s drain. A garbage disposal is powered by an electric motor that helps turn solid food into a liquid, which makes it easier go down the drain. You can easily find yourself in quite a pickle if your garbage disposal is broken. Here are just a few signs that it is time to replace your garbage disposal. Some leaks are quick and easy fixes. Others, not so much. If the sink flange or another part of your garbage disposal is leaking, you can find yourself looking at a difficult fix in front of you. A fix this tough could also prove to be quite expensive as well. There is an issue with your garbage disposal if you notice that it is clogging frequently. 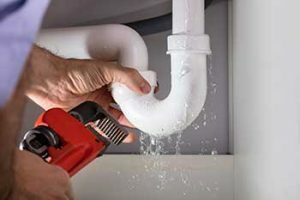 There are a few simple, quick fixes that you can do to remedy the situation, but the clogs may be a sign of something more. You may just need a larger disposal capacity than you currently have so that you will need a new garbage disposal altogether. Bad smells can get trapped in your drain lines and garbage disposal. You can treat this by cleaning it with ice cubes, citrus peels, or vinegar and baking soda. However, if these home remedies do not cure this issue (they can even cause other problems for you too), you might just need a new garbage disposal. If you are already investing in paying someone to replace your sink or dishwasher, you should consider also replacing your garbage disposal at the same time. Since you are already getting other components of your kitchen replaced, it makes sense that you might as well do your garbage disposal as well. If your garbage disposal is over ten years old, then it is highly recommended that you contact whoever is replacing your sink or dishwasher and ask them to handle your garbage disposal as well. Once the blades of your garbage disposal become dull, your garbage disposal will not work optimally. The dull blades will take longer to grind food and can even clog your drain. This entry was posted on Monday, January 28th, 2019 at 10:03 am. Both comments and pings are currently closed.